Yesterday was Julia’s 1st birthday, so we made the trip to Smokin’ Pete’s BBQ in Ballard to celebrate and listen to the fabulous bluegrass band Dysfunction Junction play, as my sister-in-law has booked them for her wedding this summer. 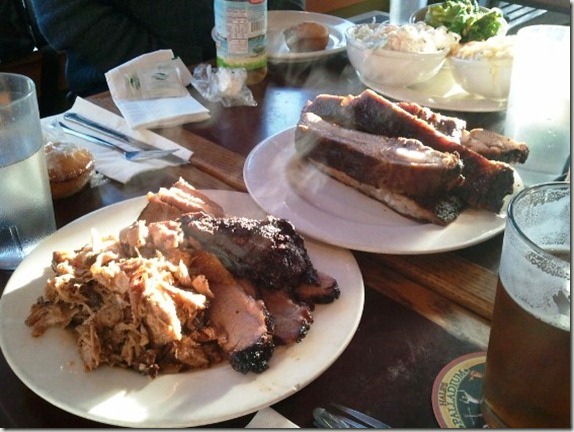 We hired BBQ from Armadillo’s at our Seattle wedding in 2009, so I was interested to see how they compared. We went for the family platter which included ribs, brisket and pulled pork on the gargantuan plates you see above, PLUS mac ‘n’ cheese, coleslaw, broccoli and a fresh-from-the-oven corn bread. Add three pints of beer and a soft drink for Ashley, and the whole feast came to just $60! The meat was delicious, tender and oozed terrific flavour, especially when married with their hot BBQ sauce. The entertainment was very cool too. I’d only ever heard bluegrass sung by Seasick Steve, so to see a whole band up there was brilliant. Can’t wait for the wedding………although chances are Ashley will be in labour! Where the heck are the bangers?